Pai Gow is a fascinating casino game of Dominoes and Cards. 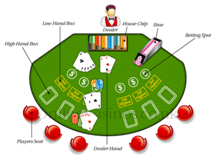 It is based on a competition between player and dealer for the best hands, which revolves around three possible outcomes; the dealer will win, the player will win or the game will end in a “push,” or tie. Like all casino games this game also requires to understand the game better and to acquire the proper skill, rather than just plain luck. With the knowing the game well and practicing, a player can manipulate the Pai Gow odds and house edge so that there will be more favourable with frequent wins and enjoyable experience. Before knowing the odds of the game let us understand briefly about the play banking, wagers and the hands. The player-dealer puts up a bank against which the remaining players make wagers. Each player has the option to take the bank twice, then the button rotates counter clockwise. A player, in turn, may decline or accept the player-dealer position. The house dealer deals eight hands (piles) directly in front of the chip tray, each consisting of four dominos. The player-dealer selects one of the eight piles as the first hand to be delivered. The house dealer places an action button on the selected hand. The position the hands are dealt to is randomly decided by the roll of three dice. The player-dealer position counts as either1, 9, or 17. The total of the three dice determines where the first hand goes. 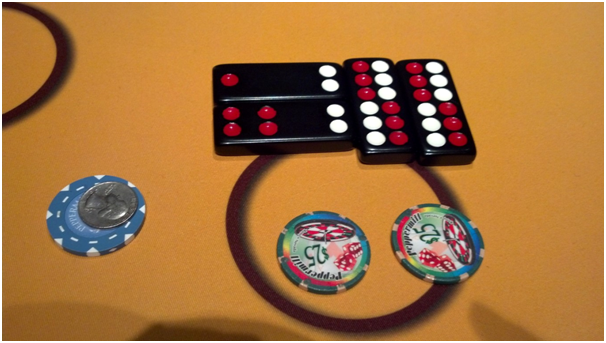 For example, if the dice total 15, the first hand would be dealt to the sixth position counter clockwise from the player-dealer’s position (15 – 9 = 6). All hands are dealt to the seat position, except for the hand of the player-dealer, which goes directly in front of the house dealer. Hands are always dealt counter clockwise. After dealing the eight hands, the house dealer picks up any hands dealt to any empty seat. Those tiles are taken out of play. Players arrange their hands into two sets of two tiles each, a high and a low hand, then place the hands face down in front of them. This is called setting the hand. A player can ask the house dealer to set the hand for him. If so, the hand is set house way, that is, in a predetermined manner. After all player hands have been set, the player-dealer reveals and sets his hand. The house dealer turns up each player hand, in turn, counter clockwise, and compares each hand, one at a time, against the player-dealer hand. All dealing, comparing, and payoffs begin with the action button and proceed counter clockwise. The order in which hands compete against the player-dealer is important, because if the player-dealer loses his stake, not all player hands may get to compete. Also, a hand may not get complete action. As an example the player-dealer puts up a bank of $200. The action button wagers $100 and the next five players wager $50 each. The player-dealer loses the first three hands, paying the action button $100 and the next two players $50 each. The bank is now empty, and the remaining three players get no action on their $50 wagers. It doesn’t matter whether their hands would win or lose against the player-dealer. A player may never win or lose more than the total of his wager. Each player, in turn, counter clockwise, has the opportunity to be the player-dealer (banker). No player is ever obligated to put up a bank. The house dealer controls the shuffling and dealing of the cards, orderliness of the game, and the house collections for each hand. Multiple players can wager on the same hand. When a player bets on a hand and is not seated at that location at the table it is called backline betting. Backline bettors often stand behind a seated player but may also be seated at another seat location. Whoever wagers the most on a hand determines how to set the hand. It’s always important to know the odds and house advantage of any game you play in the casino, so this is why knowing the odds for pai gow poker is important. You’ll want to know the player’s odds of winning a hand in pai gow poker, the odds of the dealer winning both hands and also the chance of the hand being tied. When you look at the odds in Pai Gow Poker, you may be surprised to see that on the average, 41 percent of all games end in a push, with neither the player nor the dealer coming out a winner. The odds of the remaining outcomes are almost even matched. The odds of the player winning (both his hands beat both the dealer’s) are 29 percent, while the odds of a win by the dealer (both his hands are higher in value than, or equal to, the player’s) are 30 percent. This means that the dealer, who is playing on behalf of the house, has a slight advantage. The house edge in Pai Gow Poker works out to 1.5 percent. This is relatively low compared with many other casino games. If you play carefully and apply Pai Gow Poker strategy, you can reduce the house odds somewhat more. 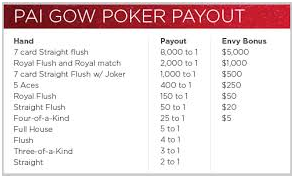 In addition to the house edge, there is normally a charge for playing Pai Gow Poker. The casino will generally take a 5 percent commission, known as the “rake,” on your winnings, although there is a commission free variant called EZ Pai Gow Poker. Both player hands must rank higher than the player-dealer’s two hands to win. Both player hands must rank lower than the player-dealer’s two hands to lose. To push (that is, for no money to change hands) one of the player’s two hands must rank higher and the other hand rank lower than the player-dealer’s two hands. So, with the odds more in favour, the chances of being dealt some action hands are greater in playing a Pai Gow game.